Kindness is simple. It doesn't have to be some grand gesture. It's the little things that people do for each other that make people happy. Simply smiling at a stranger as you pass is an act of kindness – you're sharing the love. And did you know that smiling is contagious? Opening a door for someone, helping someone carry something when they need a hand, letting someone take that car park... all these little things are the kindling to build a great fire of kindness. I believe that kindness is part of who we are – it's natural for us but somewhere along the way we've been hurt, we've been conditioned to believe that we must protect ourselves from others and so we keep to ourselves. This world is not always a pretty place but we can make it better by simply being kind to one another. Science is now showing that kindness actually has a biological effect on the body, with an increase in the anti-depressant hormone serotonin, which calms you down and makes you feel happy. It also increases endorphins; nature’s natural pain killer, and oxytocins, which are produced when people feel loved; helps us empathise, be gentle and kind as well as increasing our immunity and vitality. Kind people also have twice as much DHEA, which slows down aging and 23% less cortisol; the stress hormone. So kindness shifts your nervous system and is actually good for your health! Every day we train ourselves by repeating thoughts and habits, so why not train ourselves to be kinder by making loving kindness a repeated thought and habit. And start with yourself. What would being kind to yourself look like? Can you say nice things to yourself, about yourself? Would you make more time for being in nature? Would you shout yourself to the movies? What we practise is our choice to make. It's not always easy to be kind, sometimes you're feeling grumpy or someone is being grumpy at you, but this is the perfect time to be kind! Stretch yourself and you'll be amazed what a difference being kind makes to you and to the other person. When we give or receive kindness it actually lights up our brain. Yes, science can show how our neurons get excited and hormones are secreted. Yes, beneficial hormones for not only the giver and the receiver but all those that witness the kindness as well! So one act of kindness has a ripple effect, studies showing it spreads to 3 degrees of separation. Kindness breeds more kindness and that's why we want to plant kindness in our community. 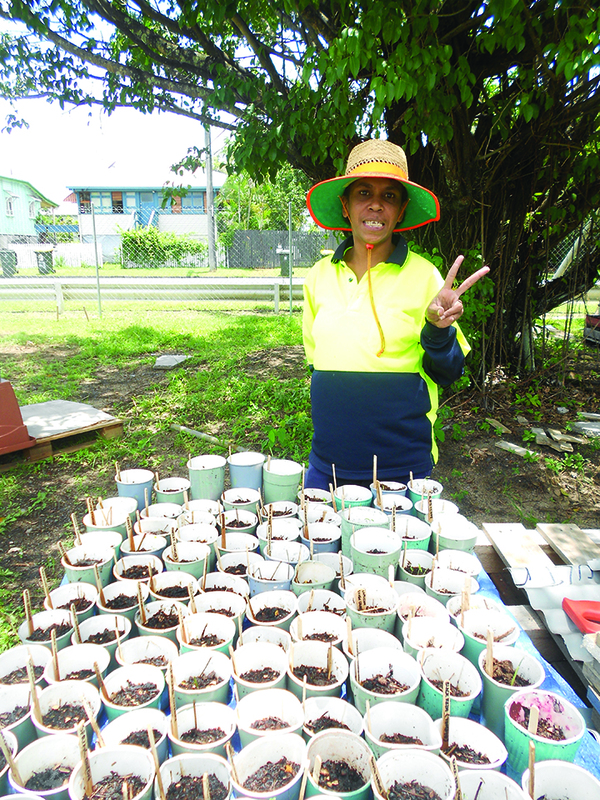 Random Acts of Kindness Week from 10th-16th February 2014 provides us with a great opportunity to join with others like the volunteers at the Bungalow Community Gardens who have planted over 140 seedlings of herbs and other food growing plants, and the Seedsavers Network who have also made up some seed packages to be given away. Thank you to the community groups and individuals who have joined us in the mission of spreading kindness. Thank you also to 4CA 846am for giving us air time everyday during this week. Kind hearts are the gardens. Kind thoughts are the roots. Kind words are the blossoms. Kind deeds are the fruits. 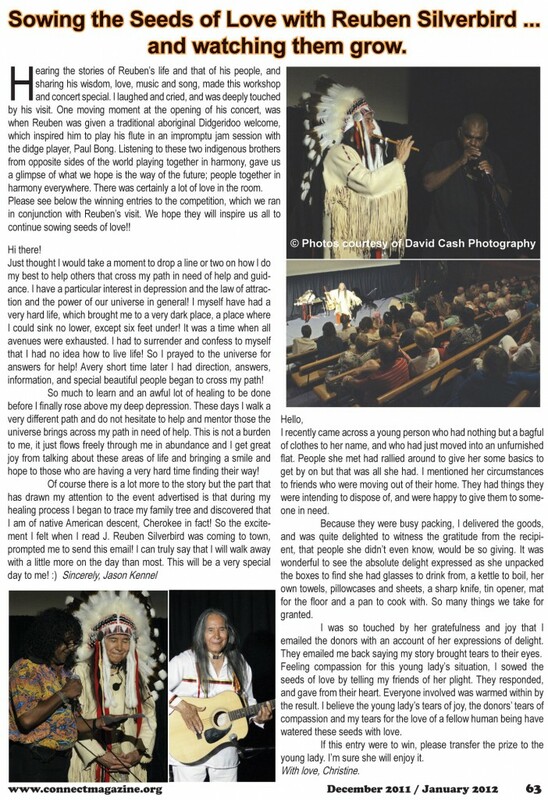 This month the feature interview came about rather spontaneously. 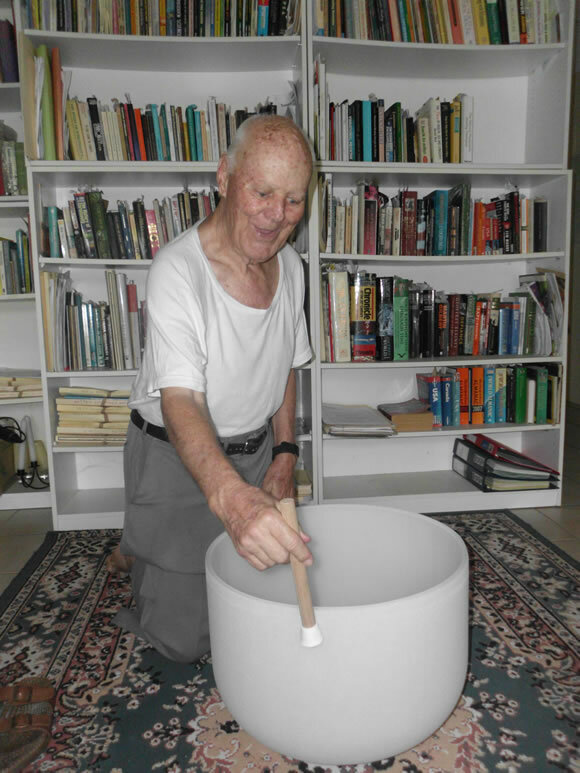 I had been phoned by Roy Turner, who wanted to buy a Crystal Singing Bowl as a gift for the Kriya Yoga meditation group he regularly attends. He was very particular about the bowl that he wanted; he had heard them before at the Body Mind and Soul Market Days at the Tanks Art Centre. It soon became obvious that Roy was quite devoted to Kriya Yoga, and as we talked I started to film our conversation, (with his permission of course). I was prepared, as the idea to write a feature on his Random Act of Kindness appealed to me, but it’s grown into quite an interesting piece. 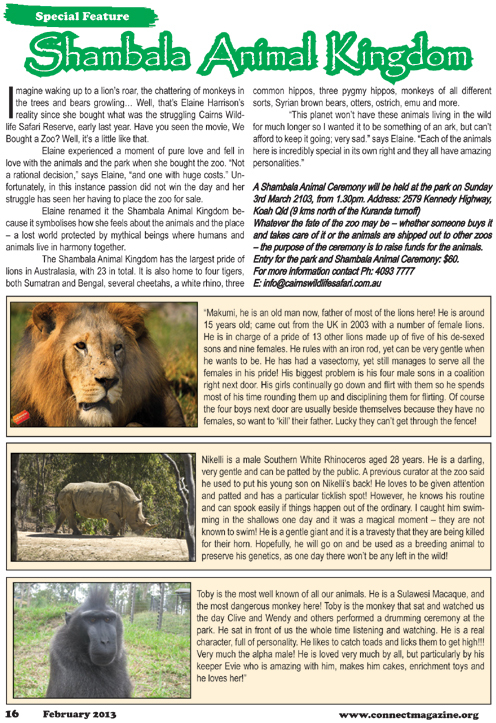 Being an elderly gentleman he amazed me with his precision memory for details… and how nice to publish good news stories! Renee: Roy, this is such a lovely Random Act of Kindness, what inspired you? 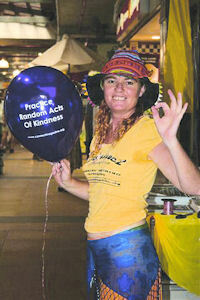 Inspired by our Random Acts of Kindness projects over the years and others from around the globe, Gill from the Mental Health Resource Service in Cairns wanted to get local mental health organisations inspired to also take on a Random Acts of Kindness project for Mental Health Week. Gill says that the Mental Health Week planning committee decided to embrace Random Acts of Kindness to demonstrate that in everyday life a small act of kindness and connectedness can make a huge difference to our own personal mental health and sense of wellbeing, and to that of others. Mental Health Week this year was held from Monday 10th –Sunday 17th October. The theme was 'Be Active, Get Connected, Stay Involved.' Well, with a theme like that how could Connect Magazine not get involved? Thanks to the kindness of various advertisers in Connect Magazine we were able to offer free vouchers to 'be active' sessions. These included free yoga classes, dance classes, drumming classes, tai chi classes, meditation music nights, counselling sessions and massage. These Random Acts of Kindness were conducted every morning from 9.00 to 10.00am, with the involvement of mental health organisations Mental Health Resource Service, Aftercare, Lifeline, Time Out Program and Worklink. 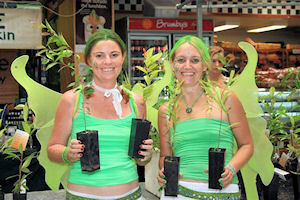 In celebration of 2010 Random Acts of Kindness Week 15th-21st February, Shilo and I got dressed up like fairies – glittery green nature spirits, to give away tree seedlings at Rusty’s market on Friday the 19th of February. This we felt was not only a random act of kindness for the individual, but also for our community and the Earth. 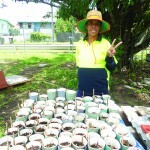 Connect Magazine purchased 100 native rainforest tree seedlings from the Curlew Farm in Kuranda and the Cairns Regional Council also donated some tree seedlings for the occasion. We gave away a total of 135 plants. Perhaps you heard us on SeaFM 99.5? They plugged our RAOK event and Connect a lot in the morning. We had a live crossover whilst at the stall and then the SeaFM car came down to Grafton St, outside Rusty’s, with their giveaways and another live crossover. Shilo and I joined Ace at the SeaFM car and gave plants away with him for twenty minutes or so. The response was obvious – we had people coming out of their offices to get a plant from us. It was a little exciting. We also received RAOK – when we were out with the SeaFM car the manager of a local coffee shop, Cocoa Amour I believe, asked if we’d like breakfast. As we already had breakfast we got a couple of coffees instead. Later we walked out to put money in the meter and I had two parking tickets! The lady who gave me the last ticket was only a couple of cars away and Shilo went over to speak with her. Shilo’s sweet-talking and explanation of why we missed the refill of the meter inspired the compassion of the meter woman and she rang the council to cancel the 2 tickets! Good on you Shi! I suppose in our costumes it was obvious it wasn’t a tall tale. Shilo and I can’t wait to get dressed up again next year. Our thoughts so far for one of next year’s random act of kindness event is that we want to walk the streets and put money in all of the parking meters. Wonder how that idea came? If you have any suggestions for RAOK please let us know or just get out and do it yourself! 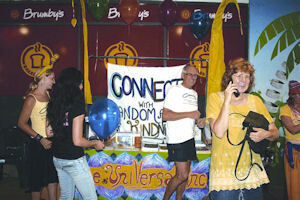 On Friday the 13th of February 2009, Connect Magazine along with the support of local businesses practised and promoted Random Acts of Kindness at Rusty’s Market in Cairns. 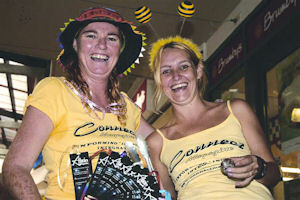 Over 300 items were given away to unsuspecting passers by as a Random Act of Kindness. Items included balloons, coffee vouchers, massage and healing sessions, fisherman pants, CDs, candles, gift cards, a reef trip and 4 nights accommodation at the Amphora Resort, Palm Cove. The team of Bee Universal Inc and Connect Magazine shared a delightful day of giving to strangers, although we discovered it proved more difficult than we expected in some cases. As we approached people we were often faced with negative reactions, some even backing away. And then there were those who assumed we were selling something. Unfortunately these people missed out. Everyone that received a gift was stunned and shocked that someone would just give them something – even though there was a small catch – to pass it on and perform a Random Act of Kindness for someone else, along with the RAOK card. So look out, one of them might be coming your way soon! Initially this project was for Random Acts of Kindness week, which was from 9th – 15th of February, however we have since decided that it is necessary to keep spreading this message and therefore it is now an ongoing project. We always publish Random Acts of Kindness snippets on the last page of the magazine and now we are opening up our website for your stories. 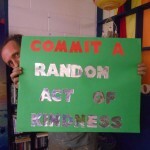 Just click onto www.connectmagazine.org and you will find the Random Acts of Kindness page to add your stories. Random Press, 99 Sea FM, Rusty’s Market, FNQ Apartments, Reef Magic Cruises, City Refresh Day Spa, Snoogies Health Bar, Café Soul Organics, Fusion Organics, Shiva Moon, Birch Carroll and Coyle, Yorkeys Knob Post Office, Personal Peace Clinic, Shivany Gonell, Geoffrey Peckitt, Jeanette Sellwood, Wendy Everett, Angel Creative Design, Cairns Copy, Vicki Maguire, Lia Scallon, Kay McVean, Universal Crystals, Groove Hair Artists, Gisele Bay-Jesperson, Allen Calendars, Pete’s Natural Therapy, Tracey-Leigh, Debbie Savage, Shilo Williams, Mark Curtis, Gerard, Nghaomi Corrie, Gwyneth Rowlands, Christine Scott, Annabel Muis, and myself of course, Renee Cashman. Thank you to the prize donors Dawn Evans, Christine Scott, Annabel Muis and Mark Ruge, Renee Cashman, Gerard, Tilly Driscoll, Billie Diamond, Cherrie-Ann Donnachie, Alain Baillon, Neil’s Organics, Katrina Greenleaf, Khin Khao Thai Restaurant, Lia Scallon and Yakov of Natural Scents. And a very special thanks to ticket seller, Mrs. Shirley Duncan. I went to visit a friend who was not feeling well and when I went to get a drink from the fridge saw she had hardly any food. She asked if I could get her some TallyO papers from the shop and I bought her a range of food for her to put in the fridge also. It felt so good to give to a person when they need it. It made MY day. thought you may be interested in this, Alexandra from the Tully times has been covering the progress if you would like more info. probably the most fulfilled feeling I have ever had, was when I did something for someone else and didn’t tell a soul about it. I wanted to, I wanted to be recognised, but then I talked myself out of that ego based emotion and just did my act of kindness, and felt a special warm feeling. It is why we are on this earth to help another to give without a thought to receiving, and then we will receive anyway. Thank you for reminding me how important this is Renee. x Annie Clark. Very true Annie. Ego can creep in so easily hey? 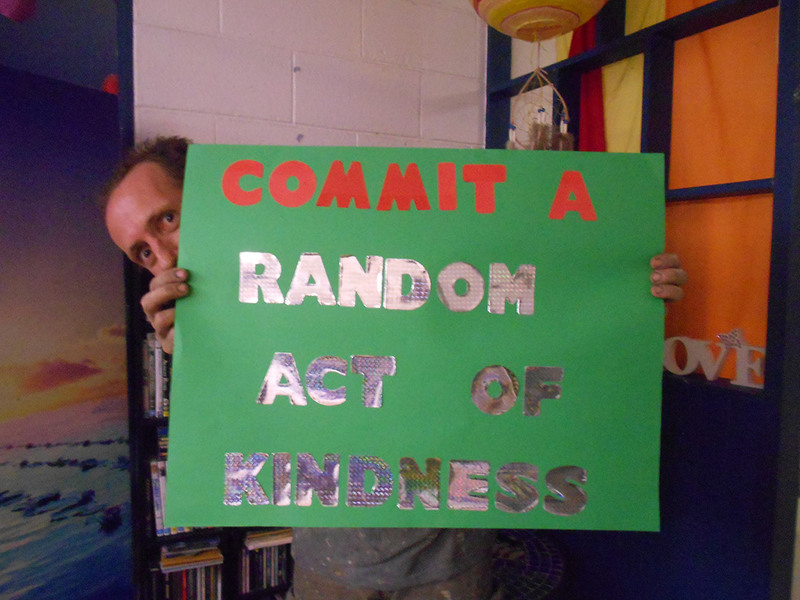 I wanted to post some Random Acts of Kindness I have recently received…. Lately I have been on the receiving end of lots of RAOK due to the fact that my car died and then I broke my finger at Karate. It all started with Nghaomi coming over at 8.30pm to look after the kids so I could go to the hospital and check out what was wrong with my swollen bent finger. Then Nathan sat with me for over 5 hours as we waited at the hospital. Thank you my dear friends. I’d also like to give thanks to Scott and Bec who have picked up my children every morning to take them to school, and my mother who’s been picking them up, and running other errands for me. All my friends who have given me lifts to where I’ve needed to go especially Nghaomi, Holli, and Gary. Sue for cleaning my kitchen and Nathan who has been so kind doing everything else to help me from delivering mags, doing school runs, cooking and cleaning, opening jars, bandaging and re-bandaging my fingers….. I’m sooo grateful for the beautiful people I have in my life! sometimes we no longer see the things that people close to us, do for us, they have been doing it for so long it becomes expected and then taken for granted. they never asked for thanks or reconingtion, they did it out of uncondional love…its how they love… but when someone else does the same or less, they get the praise and the thank yous,… because its someone new…never forget those be for them…there kindness was there love, it was not a random act. I’ve recently received a Random Act of Kindness with 2 beautiful cards annonymously dropped into my letter box with sweet messages. Such a small act of kindness but it still tickles my heart. Thank you. Hi Shiloh. Was just thinking about you and your beautiful mum. Couldn’t sleep tonight and my lovely partner sound asleep. You and Di came into my thoughts. With a couple of otherb special people. Thanks for coming into my life teaching me a thing or two and showing that lovely little town Almaden. Hope that’s the spelling. Don’t need a response. Have a great life journey. Never stop that infectious laugh. All the best Kirstyn.